Good food – how to grow it, cook it and and store it! We already have one recipe for Borscht (beetroot soup) on this site and you can find it here. This recipe is very similar but has a slightly different flavour and uses a canned beef consomme instead of stock or stock cubes (yes, you can use Oxo if you really need to) and also can be blended to use the vegetable pulp to make a thicker soup. During the beetroot glut at the end of the season we are always looking for new ways or variations on a theme and this easy beetroot soup fits the bill perfectly. salad and a beetroot chutney recipe. Wash the beetroot and par cook for approximately 30 minutes in boiling water. Wash, peel and coarsely grate the carrots. When cooked, peel and grate the beetroot as well. Finely chop the onion and leek. Put grated beetroot, carrot, onion, leek, lemon zest, celery seeds and fennel seeds into a large (2l or more) saucepan. Add the canned beef consomme or made up beef stock and bring to the boil. Turn down to a simmer and allow to cook gently for at least 45 minutes. Add all the seasoning, lemon juice and adjust the seasoning to taste. Do not overdo the salt. Cook and stir for a little longer until all the flavours are blended. At this point you have a choice. Either the soup can be served clear or be blended into a thicker consistency thus saving all the goodness in the vegetables. For a clear soup, strain the liquid through a fine sieve, squeeze every trace of liquid out and reheat. The clear soup can be served cold or hot. For a blended soup blend all together using a hand or jug blender and put back into the pan to reheat. In either case, when ready to serve place into bowls and add a large knob of creme fraiche at the centre. If you have any comments or variations on this recipe, please let us know. Enjoy Autumn. At this time of year (early August) we are usually inundated with courgettes and this year is no exception. 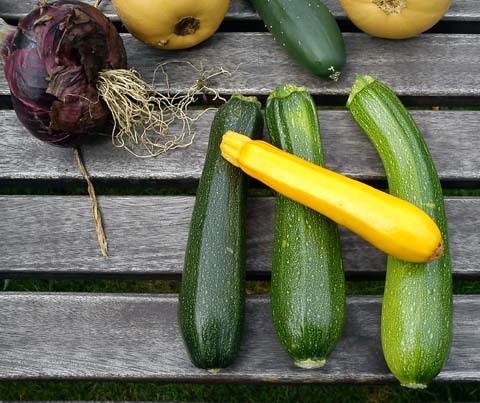 We grow two types, the standard green type either “Zucchini” or “F1 Green Bush” and a golden yellow variety of unknown origin (we were given the seeds). Of course, with all this abundance, we are always on the lookout for new ways to use them. Our crops are usually picked when they are about 6″ – 8″ (200mm) long as opposed to the normal supermarket length of 8″ – 10″ (250mm). We present below two standard free recipes that we use regularly, Courgettes Paysan and Baked Courgettes. Both recipes can accompany most meals and baked courgettes are particularly useful if you are having a barbecue. 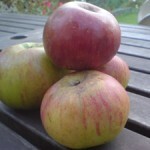 The golden variety usually have slightly more flavour and are slightly firmer than the green. If you have any suggestions for other courgette recipes please let us know – enjoy. 2 medium sized courgettes, about 350g, 12 oz. 400g can of chopped tomatoes or if you are lucky enough a similar quantity of fresh tomatoes, skinned. Optional – 1 tablespoon of tomato puree to slightly increase the acidity. If using fresh tomatoes, wash them and skin them by pouring boiling water over them and letting them stand for a few minutes. 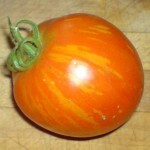 If the tomatoes are ripe, the skin should come away quite easily. Cut the tomatoes into small pieces. Wash the courgettes , trim and slice them into discs about 2mm – 3mm thick. Coarsely chop the onion. Hint: red onions improve the flavour of this dish. Skin the garlic if used. Heat the oil in a wide, shallow pan ( a saute pan is ideal) until hot enough to sizzle when tested with a small piece of onion. Add all the onion and stir and fry at medium heat until the onion is soft. Crush and add the garlic, fry for 1 minute more. Add the courgettes, keep stirring and frying for 2 or three minutes over a medium heat. Allow the courgettes to soften then add the tomatoes, tomato puree if used, salt and pepper. Bring the mixture to a simmer and then add the herbs, stir well. Cover the mixture and cook at a gentle simmer until the courgettes are tender, about 5 minutes is usually enough. If there is still a lot of liquid present, cook over a high heat for a minute or so being careful not to overcook. Serve hot with practically any main course as a side dish. Can also be served with pasta with Parmesan cheese sprinkled over the top as a main course. This dish is particularly low in calories and can be used in moderation as part of a diet. Wash the courgettes , trim and slice them lengthwise into 2 halves. Skin the garlic and slice it very finely indeed. Lay the courgettes cut face up and using your finger, spread a thin layer of olive oil on to the cut surface. Carefully place the thinly sliced garlic at random on the olive oil. Sprinkle a small amount of salt over the top and then add a generous grind of pepper over all. Wrap the resulting coated halves in packets of foil, cut side up, two to a packet making sure that the “dull” side of the foil is outside (shiny side inwards) and that the ends of the packet are twisted up to stop any juice leaking out. Cook for approximately 20 – 30 minutes in a pre-heated oven at 180C. Cooking on a barbecue can be a bit hit and miss but a similar time as in the oven is suggested but make sure that they are out of the hottest area and certainly not in the flames! This dish is also very low in calories (except the oil!) and can be used in moderation as part of a diet. 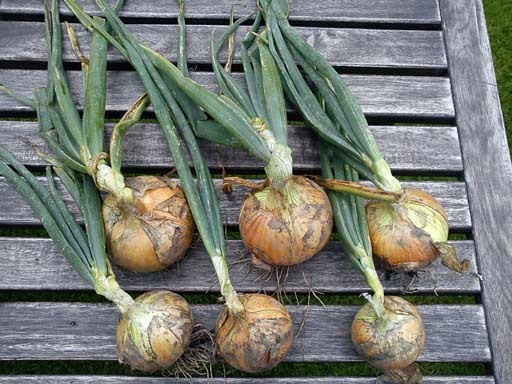 Last autumn we decided to try out some autumn sown onion sets. We were likely to be away at the critical time in the spring when we would normally plant sets and this seemed like a good idea, it would also give us an early onion crop. These were available last autumn as a special offer, 1 small pack (about 35 sets in each) of each type. We planted them out in mid October in a raised bed in ground that had been used for a previous crop of potatoes and french beans after weeding it thoroughly. Before we planted, we top dressed with a light dose of Growmore. Planting was such that the tips of the sets were just visible above ground. Spacing was about 7 to 8 inches (~175 – 200mm) so as to encourage large bulbs. At first we had some trouble with birds attempting to pull them up and we lost a few but after a while small roots had developed that discouraged the birds although several sets were at awkward angles in the ground. As the really hard cold weather developed, we were worried that we would lose the crop through frost but it soon became apparent that there was signs of growth and so we persevered. We were away during much of February and March and when we returned we were surprised to see that the sets had started to grow quite well despite the severe winter. By mid May, the crop was growing well and it looked as if we were going to get a good crop but continuous watering was essential as the weather was not helping us. We also needed to keep the weeds suppressed to prevent the onions being overgrown! Regular hoeing was necessary with a 3″ onion hoe. At the end of June it became apparent that the bulbs were swelling well although one or two were running to seed. We removed the seed stalks near the tip but a couple of plants started splitting badly. We started using the crop at the end of the month, using the mis-shapes and split ones first. We were amazed by the flavour! These onions are really sweet and are not too strong despite being very “green” at the time. The results were very pleasing and a good reward for our efforts. Of the 70 or so sets planted, approximately 60 succeeded. There were more failures in the Autumn Champion (7) trial but the quality and size of those that survived was very good. Of the Senshyu there were only 3 failures. The heaviest onion was a Senshyu at 600g (with leaves) but we had several Autumn Champion at around 425g and 4″ in diameter. We have not weighed all teh crop but I estimate that we have about 14kg (30lb) in total. We will update when we have weighed. One significant observation is that there are a larger number of large bulbs than usual, few medium sizes and very few small – maybe 10 out of the whole crop. All the onions have very good flavour but one thing that we did notice is that the Senshyu were certainly not as yellow as they show in the catalogue! These varieties will probably not store as long as later cropping varieties. However, we will dry them out, probably in the greenhouse as it is still raining, tie the onions into strings, and then hang them for use later in the year. So far it looks as if these onions will be suitable candidates for the local Autumn show – we will let you know how we get on! We will keep you updated as the trial progresses – now to start digging the potatoes! At this time of year (mid October), we always seem to have a surplus of both apples and beetroot, particularly cooking apples. This recipe aims to use up some of this surplus in the form of a tasty starter dish that is both healthy and vegetarian. It can be made quickly and easily just before the meal. The best apples to use are those that are not too acid but are “sharp”, Bramleys are possibly the best provided that they are quite ripe. A large eating apple could be used if necessary but avoid the softer types. If preparing in advance, do not slice the apple until the last minute as it can turn brown if left too long. Horseradish sauce, allow 1 level teaspoon per person – adjust to taste, not too strong. Mix the horseradish sauce and the creme fraiche together. Add the horseradish slowly and taste often as it varies in strength quite a lot. Season mixture with a pinch of salt and a little fresh ground black pepper. Adjust horseradish to taste, do not make it too strong. Cover and keep in fridge until needed. 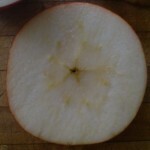 Wash the apples carefully in fresh water and slice across the core into slices about 3 to 5mm (just over 1/4″) thick. Carefully cut out the core. Slice the beetroot similarly into rings about 3 – 4mm (1/4″) smaller in diameter. 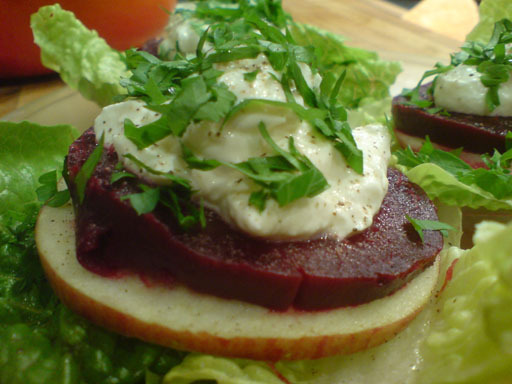 Place the beetroot rings on top of the apple slices. Just before serving, top with a large spoonful of the creme fraiche mixture, spread slightly. Sprinkle some chopped parsley garnish over the whole assemblage and place the whole on a bed of cos lettuce leaves or a square of crispy toast to serve. If preferred, a light dressing of vinaigrette can be drizzled over the whole. Beetroot is a very under-rated vegetable and deserves a much better image. This article shows you how to grow it, cook it, store it, preserve it and if I could I would tell you how to eat it as well! Beetroot is easily cultivated and has been part of man’s diet for many hundreds of years. Many writers through the ages have sounded its praises both as a food and for its herbal or medicinal properties – TRY IT! Beetroot has been part of the human diet since the dawn of time. It was certainly used by Neolithic civilisations and was well known by both the Greeks and Romans, the latter having great regard to the herbal and medicinal properties of the plant, particularly its leaves which are also edible. Beetroot is not naturally an inland plant. Its origins appear to have been associated with coastal, slightly salty soils. It does, however thrive on most soils and the modern varieties appreciate the clay soils commonly found inland in Europe. Beet has been known in England since before Elizabethan times although it was not as prized a vegetable for human consumption as it was for animal feed as the varieties under cultivation were more of the white rooted or chard varieties. The original beetroot cultivars were not as deeply coloured as the common very red variety that is usually grown in Western Europe, there being all colours of flesh ranging from almost black through purple, red and orange to white. 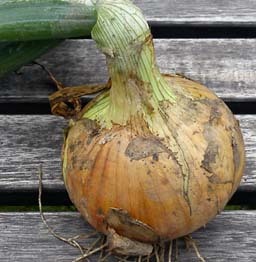 Ball shaped varieties are most common but there are also tapered, conical and cylindrical rooted shapes. Chard, mainly grown for its leaves is a type of beet and has white tapered roots much like a parsnip with branched roots. Both sugar beet and mangels are varieties of beet and form a very important economic source of sugar and animal feed respectively. An unusual delicious, smooth, velvety textured curry. Traditionally in England the default way of cooking beetroot is to boil it but this is not the only way of making this vegetable suitable for the table. Cooking methods include boiling, baking, microwave cooking, roasting and served raw in salads. Here we only discuss boiling but the quick links above give detailed information on other methods. Boiling is easy but results can be variable depending on the size, variety and age of the roots. Careful preparation is essential. The root(s) should be washed carefully to remove any obvious soil. Do not remove the skin. Carefully cut off the leaves just above where they emerge from the root, better to leave a small amount of stalk than to risk cutting into the root causing it to “bleed”. Cut any extended root (that is the “tail”) back to about 0.5″ (1cm) to 1″ (2.5cm) long. Place the prepared root(s) in a saucepan and add water to completely cover. Allow at least 1″ (2.5cm) space above the water for boiling. Do not add any salt. Bring the root(s) to the boil over a moderate to high heat and then reduce heat to simmering level. Boiling time will vary with the variety, size and age of the roots but average sizes will almost certainly need more than 30 minutes. Very small baby beet may need less, larger, older roots may need up to an hour or more. After the first 20 minutes or so, test the roots for tenderness using a very thin sharp pointed knife or skewer, it should be easily possible to push the knife all the way through the root when they are tender and ready. If they are not ready, re-test every 10 minutes or so. Make sure that the roots remain covered with boiling water all the time in order to prevent uneven cooking. When cooked, drain away the water and immediately re-fill the pan with cold water. Leave a few moments for the skin to cool and then drain and skin the roots. The skin should rub off fairly easily if they are cooked. Cut away the top where the stalks emerge and the rest of the tap root or “tail”. Remove any badly damaged areas as these may prove harder than the normal flesh. Cut the roots into segments or slices for serving and keep warm for the table. Unused beetroot keeps well and several suggestions as to how to store and preserve left-overs are given in the basic recipe link above. For instructions on how to bake, preserve or make beetroot chutneys or beetroot curry also see the links above. 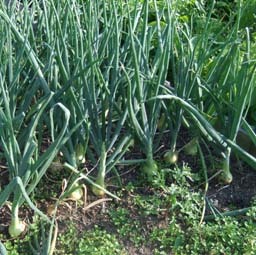 The most important step in growing any vegetable is to select a variety that will succeed in your soil and conditions. If you have not grown beetroot before, start with a variety that is easy to grow such as “Boltardy” or “Detroit”. These types whilst not producing show-stoppers are almost certainly the easiest to grow. You can progress to some of the more exotic varieties such as Chioggia (it has white and pink striped flesh), Cylindar or F1 hybrid types such as “Pablo”. For leaf beet, start with plain old “Swiss Chard” or “Silver Chard”, “Ruby Chard” or “Bright Lights” varieties can come later! Cultivation techniques for beetroot, perpetual spinach and chard varieties are very similar and the text below can be used for all types. Most soil types are suitable but highly acid, very sandy or very stony soils may not give as good results. Clay based soils should give good results. All soil should be thoroughly prepared but do not use areas that have recently had manure added, particularly if the manure was “raw”. Colourful varieties can be grown in flower borders to add long lasting and lush leaf displays as well as contributing to the pot. Beetroot seeds can be sown from early spring (March in the UK) for mid-summer crops until late summer for autumn and early winter crops or to store. Cultivation should be as part of a normal 3 or 4 year crop rotation wherever possible, beetroot should be included in the root part of the cycle. Rake the topsoil to a fine tilth and rake in a general purpose fertiliser such as “Growmore” into the top layer. Using the corner of a hoe or similar tool, make a groove about 0.5″ – 1″ deep (depending on variety – see the seed packet for details), lightly water the groove and sow the seeds very thinly about 1″ – 1.5″ (4cm) apart. It should be noted that unless you have bought a special type of seed known as “monogerm” the seeds are in fact clusters of seeds i.e. “multigerm” and will most likely produce clusters of seedlings. It is possible to break up these clusters but you do risk damaging the seed. Whilst talking about the sowing of seed, it should be noted that it is possible to sow beet seeds in modules or small pots filled with general purpose compost and plant out later. This is in contradiction to generally accepted practise for root vegetables. It can work, just make sure that the pots are deep, you thin properly and plant out without disturbing the roots. Cover the seeds with fine soil or compost, firm the soil and water gently so as not to wash away either the seeds or the soil. Germination will normally take 2 to 3 weeks at normal daytime temperatures of 12 to 18 degrees Celcius. Mild night time frosts will delay germination a little but should not cause failure. Deep or prolonged frosts may prevent germination. Excessive daytime temperatures will also deter growth, particularly if it is dry at the same time. If germination has not taken place within 6 weeks, it is likely that it will not happen at all. Water regularly during the germination period if it does not rain and make sure that the area does not get overgrown with weeds. It is also possible to grow the plants in a grid pattern, sowing on a grid of about 1″ – 1.5″ (2.5 – 4cm) apart, thinning to approximately 6″ apart later. When the seedlings are about 1″ (2.5cm) high, thin the plants to individual seedlings at 2″ (5cm) apart taking care that you disturb the roots as little as possible. Grow the seedlings on until they begin to look a little crowded and then thin again to about 4″ (10cm) to 6″ (15cm) apart. 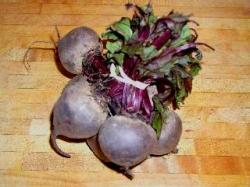 If the root balls are developed, thinnings can be used as “baby beet” when about 1″ (2.5cm) in diameter or more and the tender, small leaves can be used in salads. Again, the optimum spacing for individual varieties will vary, consult the seed packet. If growing Chard, the spacing required may be up to 8″ – 1′ (20 – 30 cm) in order to allow adequate space for the leaves. Continuous care is not necessary during the growing period and provided that the plants are not allowed to dry out for too long, get eaten by slugs, attacked by leaf miners, eaten by birds, trampled by children or dogs, overgrown with weeds or accidentally dug up when hoeing, all should be well and the roots should swell to a usable size in about 3 months. You get the picture. Leaving the plants longer will produce larger roots but leaving them too long may result in bolting (going to seed) or a “woodiness” in the centre of the root. Mulching with fine compost can also help prolong growth. When harvesting the crop, take care to loosen the soil around the base of the plant so as not to damage the long “tail” or tap root. Pick only what you can use within a week or so unless you intend to store the crop in bulk. Do not leave the roots in the ground over winter as they will almost certainly become damaged and unusable. Fresh roots will store for several weeks in a cool fridge if you have the room. Long term storage of mature roots is possible provided that they are not exposed to excessive heat or cold and are not allowed to dry out or become excessively wet. Traditionally an earth clamp would be used to store the crop through most of the winter. An earth (or sand or straw) clamp can be made by digging out a shallow trench in an area that is not prone to water logging and then piling up successive layers of soil, sand (best), or straw interleaved with layers of beetroot roots. The final layer should give adequate protection from frost and be at least 4″ (10cm) thick and covered with a simple waterproof cover of some sort. This method can also be used for carrots, turnips and similar root vegetables. We hope that all these hints allow you to grow beetroot for yourself – ENJOY! There are many claims for the health benefits of beetroot. Some of these are anecdotal, some have evidence to support them but many are based solely on hearsay. What is true is that beetroot is a rich source of vitamins and minerals and the health benefits of beetroot probably all emanate from this fact alone. Vitamin A – medium levels. This vitamin is particularly important for tissue growth and helping the immune system. The body converts beta the carotene found in beetroot and chard, particularly the leaves into Vitamin A.
Vitamin B group – relatively low to medium levels present. This large group of vitamins are essential for maintaining metabolism and the conversion of one food type into another. The group includes Folates which are essential during pregnancy. Vitamin C – high, particularly in the leaves of both Beetroot and Chard. this vitamin is recognised as being essential to maintain the immune system and help prevent infection. Vitamin E is present and is recognised as playing a part in reducing cholesterol. Vitamin K – very high in the leaves. This vitamin is essential to maintain a healthy bone structure and is assoiated with the bodies ability to take up calcium. A typical portion of beetroot may well have more than the recommended daily intake of K but this is perfectly safe. Beetroot is also a rich source of trace minerals including magnesium, phosphorous, selenium, calcium, copper and iron. The inclusion of iron in in a healthy diet is essential, however, much of the iron is in the leaves of spinach, chard and beetroot and is not easily accessible to the body. One factor that is not always mentioned is that beetroot, and to a lesser extent chard, can act as a digestive accellerant. This is most noticeable when the roots or leaves are not fully cooked and the degree of effect will vary from one person to another. The symptoms are not dangerous but for this reason we would not recommend unusually high intakes of leaves or particularly the roots. The food content of beetroot includes a fair amount of sugar as well as fibre, and a small amount of protein. cooked beetroot contains more carbohydrate than raw, about 7% to 8% by weight, around 40 calories (which is not going to break any diet) in every 100g (4 oz.). Chard leaves also contain similar amounts of carbohydrate. All the above evidence points to beetroot being an excellent food source and we hope that you benefit from its properties! 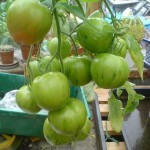 At this time of year we usually have a fairly large number of green tomatoes left either in the greenhouse or on plants that have been grown outside. This year we grew a variety called “Tigerella” and we seem to have more than usual unripe fruit and so have decided to make green tomato chutney with some of them. We have used the recipe given below many times before. It is the simplest one that we know of. Cut the tomatoes into small pieces and put into a large pan with the vinegar, sugar and salt. Heat gently, stir and dissolve the sugar. Add the spices and the onion, bring to the boil. Boil gently, uncovered, for 1.5 – 2 hours by which time the mixture should be fairly thick. Allow to cool slightly and then carefully pour into sterilised glass jars, seal and allow to cool before labelling. You can re-use commercial jam jars provided that they are completely clean and sterile. Pay particular attention to the lids. If the lids are the “pop-up” type, make sure that they do pop down when the jars are cool. This chutney will store quite well for a year or more. Let us know what you think of the results.